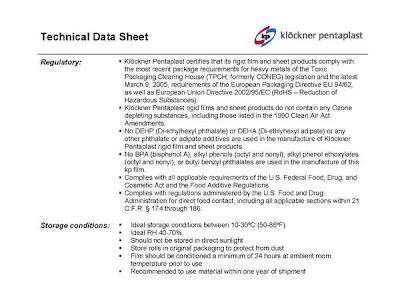 In two previous posts, I wrote to Montreal-based Italian food maker O'Sole Mio to inform the company that I had recently bought pesto and agnolotti products that did not have recycling symbols or resin identification codes (RICs) (Click here to see an RIC). I explained to company VP Fiore Napolitano that, without the recycling symbols and RICs, recycling centre workers could not sort the plastics, and these dishes would go straight to landfill. Mr Napolitano wrote back to me a few days later to inform me that the issue had been addressed and that the recycling symbols and RICs would appear on their products in their next production cycle. He also informed me that the plastics used were number 5 (the pesto container) and number 7 (the agnolotti dish). Partial success! Although both of these plastics are recycled in my area, which is welcome news, I wrote back to Mr. Napolitano to find out whether the number 7 plastic used in the company's fresh pasta dishes contained bisphenol A (BPA), a hormone disruptor. In scientific studies, BPA has been linked to breast and prostate cancer, learning disabilities and obesity. * Those at greatest risk are fetuses, infants and children entering puberty. Many number 7 plastic products are manufactured with BPA. Some are not. I hypothesized that food retailers were probably just as confused about plastics and BPA as consumers. After all, this confusion translates into success for the public relations specialists hired by BPA manufacturers, some of the largest companies in the world. To see an article published in the Washington Post on big plastic's most recent PR campaign to spin the dangers of BPA click here. Mr Napolitano promptly replied to my inquiry. I was also pleasantly surprised to see that he had attached a technical data sheet to show that the company's pasta dishes did not contain BPA (Click to enlarge). In addition, these pasta dishes complied with the European Union's regulations, which are much more stringent than those of the US FDA. Mr Napolitano also asked me to give him a call. He wanted to know more about my concerns. I explained that I was contacting companies whose products we enjoyed to get further information on their packaging practices. I told him that whenever possible, we try to avoid plastics that are not recycled in our area. We also avoid number 7 plastic unless it is indicated that the product packaging is BPA free. I also explained to him that his market segment was probably made up of people like us--professionals with children and busy lives. In a nutshell, I told him that I wanted to be able to go into the supermarket and leave with products that were environmentally friendly and would not compromise my children's health. And I got the answers I was looking for. My first foray into raising retail awareness about eco-friendly packaging was indeed positive, and I invite you all to sing O'Sole Mio from the rooftops. I will be a loyal O'Sole Mio customer...as soon as I see the recycling symbols. **Slow Death By Rubber Duck, Rick Smith and Bruce Lourie, Knopf Canada, 2009 pp. 220, 232-235.
: MomActivism: In Praise of O'Sole MioTweet this! Heather it's wonderful that you got such a positive response. Don't think they ship to the US do you? I'm off to check now. Do you have any more packaging awareness in the works? I have several companies that I would like to contact, but I have recently learned that small- and medium-size food retailers often have several grades of the same product, and they usually sell one grade directly to supermarkets. Large-chain supermarkets are notorious for using the cheapest packaging to maintain the highest possible profit margins. For instance, I've recently discovered organic chicken packaged with number 7 plastic dishes. I also discovered, through my own research and speaking to the supermarket corporate affairs officer, that Canada's largest grocery chain actually sells resealable organic baby food with seals that contains BPA. All this to say that my target should be grocery store chains.